Matthew Schera’s Grade 1 winner Glorious Empire, undefeated in three starts since opening his 7-year-old season this spring at Laurel Park, emerged from his latest work in good order and will ship this week for his Breeders’ Cup debut. Glorious Empire breezed seven furlongs in 1:27.60 over the all-weather surface Saturday at the Fair Hill Training Center in Elkton, Md. and galloped out one mile in 1:41, trainer James ‘Chuck’ Lawrence II said between Laurel’s races Sunday. It was the sixth work for the Irish-bred gelding since earning an automatic berth in the $4 million Breeders’ Cup Turf (G1) with his front-running 1 ¾-length triumph in the 1 ½-mile Sword Dancer (G1) Aug. 25 at Saratoga. Lawrence opted to train Glorious Empire up to the Turf, also contested at 1 ½ miles, rather than bring him back in the Joe Hirsch Turf Classic (G1) Sept. 29 at Belmont Park, won by Sword Dancer runner-up Channel Maker, who is also bound for the Turf. 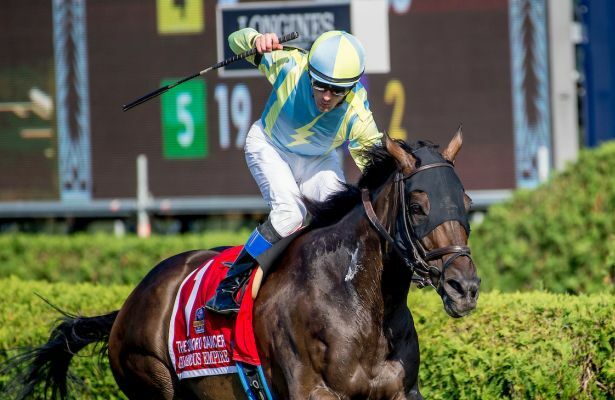 Glorious Empire ran sixth behind graded-stakes winners Caribou Club and Doctor Mounty and four-time turf stakes winner Phlash Phelps in Laurel’s Henry S. Clark Stakes April 21, his seasonal bow. It was his first race start in seven months and first since joining Lawrence. From there, Glorious Empire won an optional claimer going about 1 1/8 miles June 28 at Delaware Park, and dead-heated for first in the 1 3/8-mile Bowling Green (G2) four weeks later at Saratoga in his prep for the Sword Dancer. Julien Leparoux, aboard for each of the past two wins and three of his last four, has the return call on Glorious Empire in the Turf. Lawrence said they will leave Fair Hill Tuesday and arrive at Churchill Downs before training hours Wednesday morning. Also pre-entered in the Turf are defending champion Talismanic and Enable, back-to-back winner of the Prix de l’Arc de Triomphe, heading a strong European contingent, as well as Grade 1 winners Sadler’s Joy, Hi Happy and Robert Bruce from the U.S. and Quarteto de Cordas, a Group 3 winner in his native Brazil.